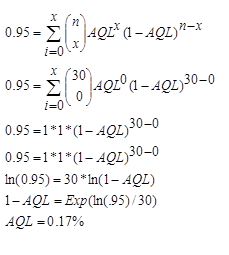 Q: I am reading ANSI/ASQ Z1.4-2008: Sampling procedures and tables for inspection by attributes, and there is a small section regarding inspection level (clause 9.2). Can I get further explanation of how one would justify that less discrimination is needed? For example, my lot size is 720 which means, under general inspection level II, the sample size would be 80 (code J). However, we run a variety of tests, including microbial and heavy metal testing. These tests are very costly. We would like to justify that we can abide by level I or even lower if possible. Do you have any advice? The product is a liquid dietary supplement. A: Justification of a specific inspection level is the responsibility of the “responsible party.” Rationale for using one of the special levels (S-1, S-2, S-3, S-4) could be based on the cost or time to perform a test. Less discrimination means that the actual Acceptable Quality Level (AQL) on the table underestimates the true AQL, as the sample size has been reduced from the table-suggested sample size (i.e. Table II-A has sample level G of 32 for a lot size of 151 to 280, while General Inspection level I would require Letter E or 13 samples for the same lot size). Justification of a sampling plan is based on risk and a sampling plan can be justified based on the cost of the test, assuming you are willing to take larger sampling risks. 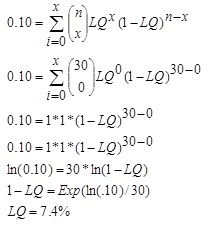 If you use one of the special sampling plans based on the cost of the test, it is helpful to calculate the actual AQL and Limiting Quality (LQ) using the following formulas. Q: When inspecting components on tape and reel, pulling parts at random can present a problem in a pick and place operation. Also once removed, the samples would have to be put back on tape for use. Is there a practical or common sense procedure to follow? A: This is not an uncommon problem and I know that I’ve been in a similar situation. What we did was to inspect at the beginning and the end of each tape. That way we were not causing disruption to the process. It worked pretty well with the suppliers we had. But prior to doing that, we certified our suppliers by going to their facility and performing a process audit to make sure that the process was meeting our requirements.